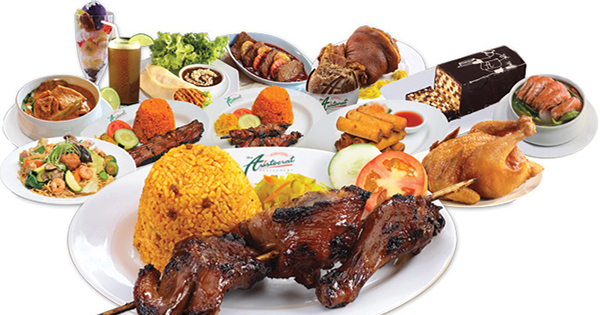 What better way is there to chill with your loved ones and friends, than to try out authentic Filipino cuisine when in Manila, which is the capital of this beautiful country – where good food is tantamount to good mood. #1 - The Aristocrat: This 80-year old-full-of-vitality Filipino restaurant was founded by Lola Asiang Reyes, a very committed mother to her own family, who thought of serving hearty and affordable Filipino meals for others too, as a business by converting their home’s ground floor in Marquez de Comillas way back in 1928. She would cook several dishes such as THE best chicken barbecue, pancit luglog (noodles with veggies), dinuguan with puto (pork dish with native bread), lumpiang ubod (fresh vegetables with garlic sauce) and arroz caldo (congee) – and did it with love as if she was serving her own family. Hence, this catapulted her to fame and she was dubbed as the Mother of Filipino Cooking in 1980. #2 - Café Via Mare: For over 40 years, Café Via Mare has been well-loved and approved of by Filipino food lovers – what with their delish bibingka ( buttered cake made from rice), puto bumbong (a yam-based delicacy), pancit luglog (veggie noodles), and dinuguan (pork dish with pork blood), along with many other fantastic dishes! This outstanding restaurant also has oyster bars and provides very impressive catering service for all you seafood lovers, business entities and occasion planners out there. What is more, Café Via Mare is proud to announce their cool and healthy Filipino smoothies available now, such as the Guyabano Ginger Cooler, Super Guava Kamias, Buko Calamansi Frenzy, Guyabano n’ Kamias Beat as well as the Guyabano N’ Caimito Twirl -- to beat the heat in the usually sunny Philippines. #3 - Guevarra’s by Chef Laudico: If you and your company are in the mood to gorge via reasonable prices, then go ahead and satisfy your craving at 387 P. Guevarra Street, San Juan, Luzon. Guevarra’s by Chef Laudico is a 1920’s heritage house dining place that serves buffet lunch and dinner every day. Not to mention, it also provides function rooms where you can celebrate your life’s milestones or discuss with business associates while having the best tasting selections such as salads, soups, desserts like halo-halo (mixed sweets with crushed ice ), chocolate and yam ice cream, lechon (roasted pork), grilled chicken and fish, Kare-kare (beef with veggies in peanut sauce), yummy chocolate porridge, and so on and so forth – so worth getting helping after helping of these mouthwatering delights! Furthermore, as if all of these creative masterpieces of Chefs Roland and Jackie Laudico are not enough, this awesome duo has also come up with the perfect garden setting if you prefer having a nice cocktail in a serene ambience. #4 - Max’s Restaurant: Is literally the house that fried chicken built! After World War II, Maximo Gimenez, a Stanford-educated teacher, made many American occupation troops, stationed in Quezon City, as his friends. These soldiers regularly visited him for rounds of drinks and would later on, pay him for it. Thus Maximo decided to establish a café to serve food and drinks for his military friends. At first, his store served only chicken, steaks and drinks. Eventually, Maximo’s niece, named Ruby, helped him create a special recipe for chicken, making it really tender, juicy and crisp – which became an instant favorite not only for these troops but also for the Filipino public. Hence Max’s Restaurant was born. This amazing restaurant has in time, become a household name both here and abroad – with branches in Metro Manila, Southern and Northern Luzon, Cebu, California, other places in the United States, as well as Canada. Fortunately, for business enthusiasts out there, Max’s Restaurant is now also up for franchising. So, tarry no longer, off we go to a winner dinner – that’s at vibrant Max’s Restaurant! #5 - Dad’s World Buffet: Come one, come all, let’s dine over at Dad’s – Saisaki – Kamayan Restaurant, also known as DADS World buffet – fill yourself up with all those sumptuous Filipino and other international meals, namely, Lechon de Leche, Crispy Pata, Lechon Belly, Pritchon de Leche, Kare-Kare, Kamayan Soup; Sushi, Churrasco, Tacos, Paella, Beef Ribs in Hickory Sauce, Pasta, Beef Souvlaki, Lamb Curry, Vegetable Samosas, Indonesian Roast Chicken, Kalbi Jjim, Hainanese Chicken, Poh Pia Tod, Dimsum, Salmon… and loads of other ultimate tummy delights! Alongside with good food, let DADS World buffet also set you in the mood for bottomless drinks that include: fresh mango shake, green mango shake, dalandan shake, watermelon shake, buko pandan shake, four seasons shake, banana shake, carrot shake, iced tea, orange juice, mango juice, pineapple juice, lemonade, blue lemonade, coke, sprite, royal and milo! Oh-so-heavenly!